Perhaps I’m insufficiently attuned to things deep and meaningful, but I should have thought that this was a quite unremarkable paragraph. What the US needs is an atheist to run for president. Yes, it is probably correct that he/she could never get the votes a a secular candidate in the evangelistic smothered United States. However just think what a smash hit that person would make in the media. Just imagine! One of the most asked question would be “Don’t you believe in God???? ?” Wow! That would be the talk of the world. Pundits and news commentators would have a field day. Preachers and other bible thumpers would go ballistic with wrinkled brows, red faces, sweaty palms, and clenched fists and they would never cease to call foul! Doesn’t that image exit you? The entire event would make large numbers of people to start thinking about it rather than conforming like robots. That would be a very positive outcome. I would like very much for Bill Maher to run in the next presidential primaries as an atheistic candidate. I’d prefer someone science rational and politically competent in preference. Pampleteers never work. We currently have a black President. A socialist candidate had a greater success than I would have ever thought possible. Now we have a woman who will be nominated by the Democratic party for President (she will win!) and so now I’m thinking that an atheist President isn’t as far fetched as I originally thought it was. Who would want that narcissistic, thin-skinned born-again bully, who will make enemies all over the world, and who will drill for natural gas and pollute the environment, and will start a movement like France’s National Front (a fascist movement, driven by xenophobia and bigotry), as president? This ticket is a symptom of pathology, pure pathology of the people. You have a good point, but a good comedian might be the best. I’m not so sure someone of “science rational” could be a politician and go through that process.. I think LaurieB should run. It’s not too late. She has a science background, is progressive, gutsy, and is funny as hell too. What do you think? She’d get my vote, Dan…. The second amendment will be deleted. A gun buy-back program will follow. School curriculums will be nationalized with details of the curriculum developed by experts at the top of the fields. Textbooks reviewed for religious content to be deleted. Higher education reform that doesn’t block students who qualify to continue based on their ability to pay. Good students should continue in their education as far as they can. Health care will be nationalized and will include free birth control (kiosks on every street corner) and free abortion with severe penalties for aggressive religious nuts who protest, loiter nearby or try to block the patients. Religious establishments will be taxed at top rates. Any money flowing to them from public taxes will cease. The RCC will be prosecuted for its crimes and sued for maximum reparation penalties. Victims will be compensated and after that any money left over will be used to create a fund, in combination with the taxes from religious establishments to set up clinics and schools in the third world that will compete aggressively against similar institutions currently run by religious groups. These insidious predators must be vanquished. The two state solution will be implemented immediately in Israel-Palestine with a multinational peacekeeping force for enforcement. Not the UN because it’s seen as a tool of USA and has no respect in that part of the world. Take the number one recruitment issue off the table for jihadists/Islamists and then real negotiations can begin. The two state solution will be implemented immediately in Israel-Palestine with a multinational peacekeeping force for enforcement. Excellent Uncompromising agenda. Just the thing to get the media asking (at least some of) the right questions for a change. You’d get my vote (if I had one, which I don’t, not one that’s transferable to the USA). Laurie, while you’re opening cans of worms with a Rationalist Agenda: Propose a full scale inquiry into the failures, not of intelligence, but of duty, for those in positions of authority on and immediately before 9/11, all the way to the top, none of whom were ever sanctioned in any way for the glaring failures in domestic security that let a few hijackings do so much damage. Basically go after anyone who failed to follow protocol on the day, or tampered with evidence to cover their incompetence. Bust a few senior ranks of their stars, and their pensions, and jail a few more, offer immunity/witness protection deals to whistleblowers and enjoy the spectacle. It strikes me that the Widespread Gross Incompetence Theory has never been tested in the courts. Mind you, that would need a judiciary that wasn’t also just as grossly incompetent. Decades of political appointees have probably leached away all competence that ever existed there. I definitely want that can of worms to be opened. In fact, it would be an olympic sized swimming pool of worms and so much the better. The death and destruction that those people at the top brought down on innocent people in this world is completely disgusting. Then, after that they walked away from the whole thing unscathed and went on to make millions of dollars and are living a life of privilege and comfort in the lap of luxury. This sets a dangerous precedent for future incompetence and corruption. Not that I thought we were paragons of honesty and transparency, that’s not the case, but in the Bush years it was very clear to anyone with half a brain that the President was a redneck half-wit and he surrounded himself with corrupt self-serving greedy cruel psychopaths. Why weren’t they all arrested? I barely remember the day Nixon quit after getting caught with his hand in the cookie jar. I remember him getting on the helicopter that took him away. (My mom was crying). And now look what the Bush administration got away with. It’s much worse and they never acknowledged a bit of it and never paid a penalty for anything. I met Cornel West when he spoke near here in Harvard Square. He had a new book out at the time. He’s a wonderful speaker. So charismatic. He made mention of the importance of “our atheist brothers and sisters…” in the fight for social justice. The crowd laughed in a good natured way, you know, because he’s religious and all. But I thought it was good of him to acknowledge that good actions aren’t dependent on religion. He shows up on Bill Maher’s show from time to time and I always enjoy watching him. 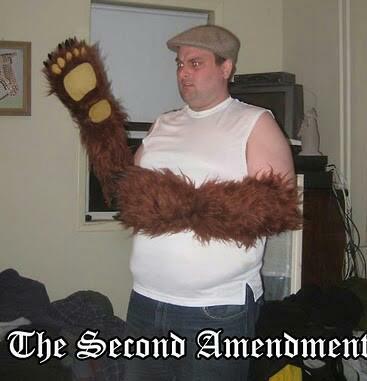 I agree with your motive on that one, however I would prefer the 2nd amendment to be altered, not repealed. It should say that only the state militia can carry military grade weapons. That way such a repeal might pass. in their education as far as they can. Yes, however I would insist on the term “good students”, “good” meaning students who are high achievers not just high conformers to social and cultural standards. Also “good students” are those who value their education above their socialization during classes. Yes, I heard West for the first time a while back. The topic was liberation theology; it was memorable. And I have heard him speak many times since then. He seems to have read everything. On TV he doesn’t have enough time to expound and elaborate, which is frustrating. I agree that the only way to deal with the 2nd, in reality is to water it down. The regulated militia is the obvious solution. I can live with that because it’s such a massive improvement to the situation as it stands right now. If I am elected there will be no evangelicals near our textbooks and curriculum. I don’t trust them as far as I can throw them. Department of Education will invite the best academics and educators to collaborate on this project. Good students are defined by their data. Top achievers are a great value to the country and must be boosted up by everyone. Lack of money shouldn’t get in the way of this. I’d like to rake off the top students and propel them forward. I’d like to know more about how other countries handle this. I’d like to know more about how other countries handle this. Once upon a time grades brought grants. Fees plus a living allowance, for those who made the grade. And no paying any of it back. Now it’s loans, instant debt for bright-ish young adults (who may or may not have made the grade under the old system), whether they graduate or not. A 20-something I know said most would be better off using the same amount of debt to travel the world for a few years. for those who made the grade. I agree completely. Perhaps an expanded Pell Grant means of support. For those dedicated to high achievement, then it would be a free education to certain success without going into enormous debt! But NO LOANS needed by anyone. If the US can go into an unwanted war and spend trillions, we can certainly afford to support students. Over the years, that kind of an educational financial system would pay off very well. It is truly tragic how the US looses it’s most precious commodity: brain power. Where is this movement from grants to loans taking place? Sorry, I don’t think I know where you are located. US? I’m under the impression that European students are still able to continue on in their education without burdening themselves with a huge amount of debt. Canadians as well. I have two nieces there and they participated in demonstrations a while back over tuition increases proposed by their government. When they found out what their cousin’s tuition cost here in the US for a mediocre state college they almost dropped their teeth. It was four times what they were paying in Montreal. They went back to school there with a different perspective on the whole tuition thing. Four years at a state college cost us/my daughter (conservatively!!!) ninety thousand dollars. A friend of ours from another country said that many young people would be better off taking that money and startng a business with it. Can’t disagree with that since we have here plenty of less than stellar students who lump along in majors that won’t pay anything when they get out. They could end up working at Starbucks and paying off two hundred thousand bucks in loans for the rest of their lives. Financial disaster for a generation. No. cbrown’s suggestion maintains the loophole of ambiguity. Not advisable, in my opinion. Madame (future) President, the 2nd amendment probably needs to go completely; it’s always being distorted. What is a “well-regulated militia” anyway? Two people can constitute a militia. I haven’t any idea what a militia is and no one else does. We don’t form militias anymore, do we? What constitutes a “state militia”? Does that mean something other than law enforcement? the military? Or does it refer to any group of private citizens, individuals (hardline right wingers, white supremacists) deciding to form a “military” organization? Anyone know? Thanks for clarifying. You shall be offered a Cabinet position in the Laurie administration. I once thought that the National Guard more or less fit the bill of “well regulated militia”. Basically part-time reservists, able to be called up at a moment’s notice in times of need, and they’d definitely need the right to be armed. Along with trained, and disciplined. But maybe that’s not what the NG is. I had 2nd thoughts when I heard of the Air National Guard, especially the Texan one, which seemed more to serve the purpose of protecting well connected draftees from being exposed to the dangers of real military service. And then the real NG got shipped off to Iraq. That seemed utterly wrong too, isn’t their brief to be the local Good Guys on the ground around home? So they can help out when the levee breaks, for example. No, obviously NG isn’t the Well Regulated Militia of the 2nd Amendment. Any other suggestions? Again, I encourage everyone to read the great philosophers, from Aristotle onwards. Re grants vs loans for students: in UK at least, what were grants 45 years ago are now loans. That’s a pity. Now your students will graduate with massive debt just like ours do here in US. This is having a very large bad effect on students individually and for the economy in general. Think of real estate. Instead of graduating and saving for that first condo or house, instead, they have to pay off the loans for a number of years. This causes a drag on the housing market as the first time buyers just aren’t out there like they used to be. I’m sure there are other ill effects from this as well. So depressing for them. How about a plan to reduce the “debt” to the amount of a home loan?? The payoff would then have a 3% interest on it. Well, it’s just an idea that could be considered..
And I like your idea for incentives for families with two children or less. I also don’t mind a mild financial punishment for more than two. Not sure what though. The drafting of any legislation on that, would have to be a bit careful! Of my three, the two youngest are twins!! Some people even have triplets or quads!! A tax provision could be made to recognize the second birth, not merely the second child.